Stock markets worldwide have fared terribly during the year 2008. While the US declined 36%, Europe was also severely affected. While UK tumbled 35%, France lost 45%. It was no different for stock markets in Asia.The emerging giants, China and India, witnessed a serious fall, ending all discussions on the much talked about ‘decoupling theory’. The Chinese market tanked by 65%, while India lost 54%. 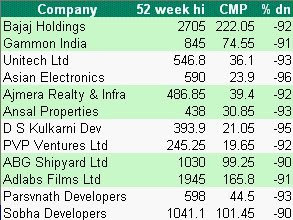 A look back at the sectors and top gainers and losers of Nifty and CNX 500 shows all the sectors except FMCG(-14%) and Pharma(-34%) have fallen more than 50%.BSE Realty index has lost more than 80%.Top losers of Nifty and CNX 500 stocks show they have lost anywhere between 40 to 90%. 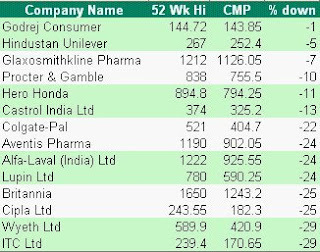 Stocks which have fallen less are those in FMCG and Pharma sectors. 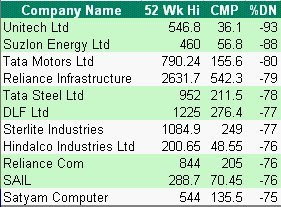 These are considered defensive stocks during such down trends. Going forward,stocks in sectors like FMCG,Pharma and with Brand names are likely to outperform.Looking at the current interest rate scenario PSU Banking stocks and selective private banks, would also outperform. Quite a bloodbath. Hope next year improves. The most disappointment are China and India's biggest drop. yes,these tow markets went up the most, last year and the fall was steeper.